This is my 29th installment of Babywearing Stories 365. Each installment features a babywearer in 1 photograph and their answers to 5 questions. My goal is to normalize, promote and celebrate daily Babywearing, moving beyond *what* we use to carry our babies and shifting focus back on *why* and *where* we carry. I hope to share the stories of moms, dads, and babywearing caregivers all over the world. Enjoy! Who: My name is Sha and I’m a first time mom. I’m wearing my daughter Ela who was born December 2012. She was about 4 or 5 weeks old in this picture and this was the first time I wore her out in public (we started practicing at home a couple weeks before). My mom was with us but in a different area of the store. We were at Walmart in the photo. I was still on maternity leave but going a little stir crazy being at home all day so we decided to take a quick trip to the store. I’m using a Moby wrap that I was able to buy 2nd hand before Ela’s birth. I was very intimidated by the wrap to begin with but thanks to some helpful YouTube videos I was able to put it on and wear my daughter with confidence! 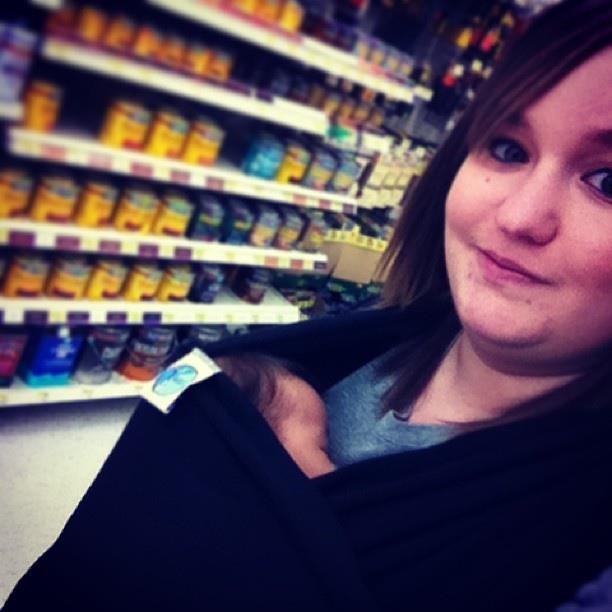 Why: Baby wearing was very appealing to me when I first heard of it and I’m so thankful for my carrier! I love wearing her because it gives me the chance to be productive and still have her close & happy. I love all the extra baby snuggles too!